What if I told you there was a special type of Law of Attraction magic? It’s a very powerful magical force that can help you transform your life rapidly. Each time you use it, you align with your heart’s desires and pull them to you. This magic is very easy to use. Everyone has it, but many never find it. This secret Law of Attraction magic isn’t a spell nor a trick. It’s as simple as the word YES. You can use this magic simply by saying YES to love. But before you use it, there are some things you need to know. You are worth saying yes to yourself. You are worth saying yes to the money you want. You are worth saying yes to the ideal romantic relationship you want. You are worth saying yes to anything you love. So why have you been saying no to your heart’s desires? What would it take for you to say no to the things you don’t want and yes to the things that make you feel alive? Can you start today by focusing on what you love? Can you choose to say yes to the things you love – the clothes you love, the foods you love, the activities you love? And, at the same time, can you say no to anything you don’t love? When you say yes to what you love, Law of Attraction magic begins. Things happen at an unbelievable speed and miracles manifest. 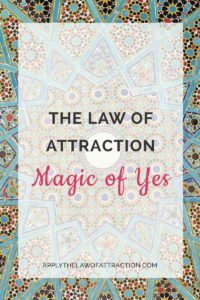 This might sound like some kind of New Age-y light-hearted gimmick, but it is a powerful Law of Attraction magic that makes things happen for you. What would your life be like if you could only say yes to doing, being and having what you love? What if you couldn’t say yes to anything else? Would you say yes to more fun, travel, adventure, or surprises? Would you say yes to freedom, success or authenticity? Would you say yes to confidence, growth or happiness? Make it a challenge if you like. Try it on for 7 or 30 days. Go through each day saying yes to what you love. Watch the Law of Attraction magic change your life.